Why Won’t Consumers Pay for Productivity Apps? Although it’s not an “app” per se, Fancy Hands, the virtual task service has a really compelling way of reminding you how much value they’re delivering. 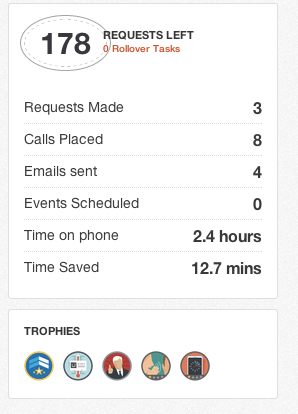 While I’m not into the Trophy gamification, the dashboard review of activities and time saved is masterful IMO. Compels me to think “damn, look at all that time they saved me, I would have hated to make those calls, etc.” And it’s cumulative, so builds over time. I don’t even really understand it all – such as the difference between “Time on phone” and “Time Saved” but who cares, it feels right. Could you apply this same idea to productivity suite tools? How much time has this email app saved me via filtering spam or message prioritization? How many unique people have collaborated with me on the docs I’ve created with this tool? Does each app have a set of native metrics that could be elevated and used to justify charging in different ways?